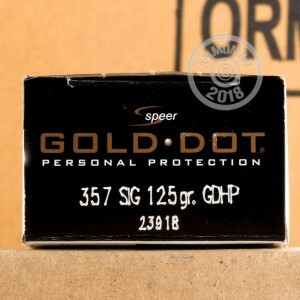 This .357 SIG ammunition from Speer's Gold Dot line is a highly effective defensive load for your carry weapon. A widely issued round for law enforcement officers in the US, Speer Gold Dots feature bonded-core bullets with molecularly fused jackets that deliver maximum weight retention with no risk of core-jacket separation. 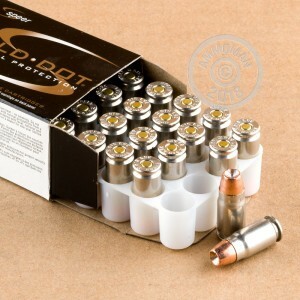 Each cartridge in this box of 20 fires a light 125 grain projectile at 1,350 feet per second. This high velocity helps produce stronger expansion and penetration to stop assailants quickly. This ammunition is loaded in Lewiston, Idaho using nickel-plated brass and non-corrosive Boxer primers from CCI, Speer's sister company.